Maps are vital for the geographic imaginary of the state. They are, as David Harvey (2001) and others (see, for example, Crampton and Elden 2007; Elden 2013) remind us, instruments of a Foucauldian power/knowledge nexus that interlock in a particular mode of governmentality. Their authoritarian and authoritative representation of reality legitimises and makes possible state governance and the exercise of violence over territory. There exists, however, a mismatch between the cartographic need to map territory and the historically dynamic nature of territory itself. Territory is neither a static container nor a dehistoricised social relation. It is instead a formative force and a historically contingent category. Maps need therefore to be constantly adjusted to reflect changing political realities. The consequence is a weakening of their authoritative nature which, in turn, can potentially damage the geographic imaginary of the state. In other words, territory is revealed to be a process rather than a permanent and truthful reflection of reality. This was made visible in a recent news story which by and large seems to have gone unnoticed by geographers. The Chinese President Xi Jinping visited the German Chancellor Angela Merkel on the last leg of his 11-day tour of Western Europe in March. The event was marked by at least two controversies. The first was Merkel’s refusal to allow the Chinese delegation to pay an official visit to Berlin’s ‘Memorial to the Murdered Jews of Europe’ (Denkmal für die ermordeten Juden Europas) and the smaller ‘New Guardhouse’ (Neue Wache). The Germans feared that the visit could be linked to the atrocities committed by Japan in WWII, and were unwilling to be seen to be meddling in ongoing Chinese-Japanese propaganda affairs (Der Spiegel 2014). The second controversy revolved around a map that Merkel introduced to Xi during their visit at the Chancellor’s Office. The map (see Figures 1 and 2) is a 1750 German reprint of one drawn by the French cartographer Jean-Baptiste Bourguignon d’Anville in the early 1730s–‘General map of China drawn on special cards that the Emperor Kangxi had made on location by the Jesuit missionaries in the empire’ (Carte générale de la Chine Dressée sur les Cartes particulières que l’Empereur Cang-hi a fait lever sur les lieux par les Jésuites missionaires dans cet empire). 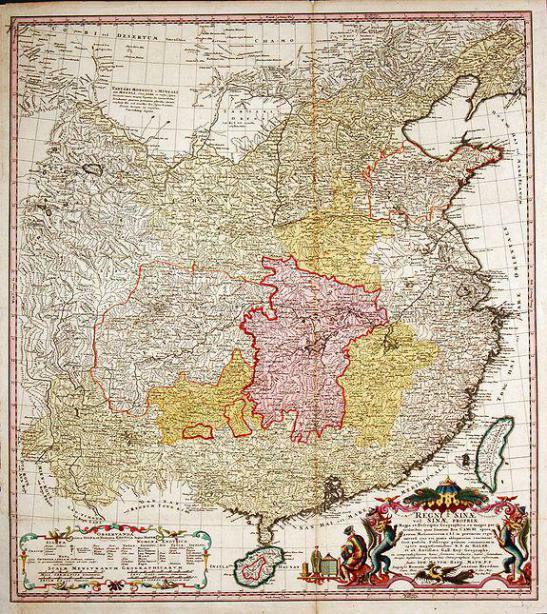 The map was the product of the labours of French Jesuits who, employed by the Qing Emperor Kangxi (1661-1722), for the first time were to demarcate the territorial extent of China. The unprecedented scale of the project was realised through extensive land surveys and data collection from extant local and foreign sources (primarily Russian and Mongolian). The result, the so-called ‘Kangxi Atlas’ (Kangxi huang yu quan lan tu or ‘Kangxi map of a complete view of imperial territory’) was the “world’s first systematic application of a trigonometric survey…to an entire state” (Millward 1999: 72). It is important to frame this endeavour in a global geopolitical context of Empire which was driven by modern science as a means of the state to both colonise new and govern existing populations. The Qing court maintained, for example, direct contact with the Louis XIV who had earlier sent numerous highly-skilled Jesuits to China. The later Qing “expansion to the north-west parallels European state-building and expansionism in its concern with measurement and the ‘scientific’ gathering of geographic and ethnographic data to undergird national and imperial control” (Millward 1999: 76). Elliott (2000: 261) notes that the map was, “until the early twentieth century, the basis for almost all later Western maps of China”. 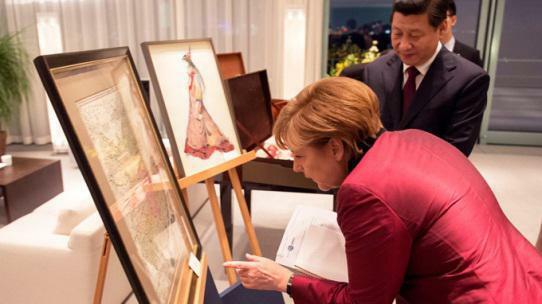 The fact that Merkel presented Xi with a copy of the Kangxi map led, for obvious reasons, to immediate uproar in China. The territories of Xinjiang, Tibet, and, importantly, the South China Sea are left outside the territorial borders of China proper. Many of these lands were only later, during the reign of the Qianlong Emperor (1735-1796) territorially integrated. Furthermore, the islands of Taiwan and Hainan are drawn in a different colour which similarly problematizes Chinese historical claims of sovereignty over these lands. The Chinese state media consequentially chose to show a different map (Figure 3) to its audience, rewriting history to inform its readership that China’s territory in 1735 was significantly larger than it is today (see Xinhua 2014). The year 1735 is symbolic, since it constitutes the first year of the Qianlong Emperor whose reign was responsible for the biggest land grab in modern Chinese history. The alternative map promoted by the state media is historically less influential and significant. 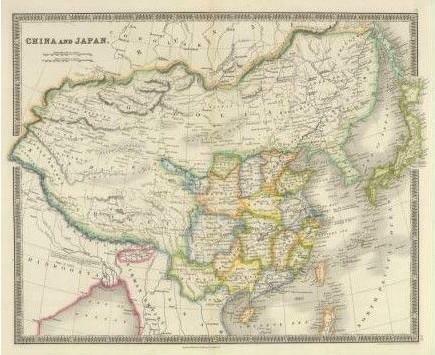 The map, generically titled ‘China and Japan’, was drawn by the relatively unknown cartographer John Nicaragua Dower as part of a larger world atlas, after the Qing’s colonisation of the western territories in the second half of the 18th century. This discrepancy between the d’Anville and the Dower map was soon noticed and picked up by Chinese internet users who almost immediately started speculating about the underlying geopolitical motives for Merkel’s decision to give such a controversial gift. Die Welt (2014) reports that numerous maps on Chinese blogs started colouring (Outer) Mongolia and the disputed territories with India in red. Other maps highlighted additional territories, now belonging to contemporary Russia or Mongolia (Figure 4), in the same colour. Such representations, characterised by a sense of territorial loss, are often grouped under the label ‘humiliation maps’ and have, since at least the early 20th century, played an explicit role in the geographic imaginary of the state (see Callahan 2010). Some Chinese internet users saw the map, however, as a German warning to China against aggressive Russian colonialism in light of the current situation in Crimea (Epoch Times 2014). Others blamed Germany for empowering Uyghur and Tibetan separatists. Historical maps depicting the geography of the numerous dynasties conventionally incorporate these areas into the geographical imaginary of the contemporary territorial state. The territory of China becomes as such a historically immutable and impermeable container that dates back to at least the Han dynasty (206 BC-220 AD) if not earlier. The fact is, however, that territory is neither permanent nor primordial, and China is not an exception to that rule. Territory is rather a dynamic and contingent historical process. It is often forgotten that China only started to territorialise its Empire at the time of the rise of modern cartography in the late 17th and 18th centuries. Scholars (see, for example, Jacob 2006; Edney 2009) have already pointed out that Empire and cartography are intrinsically related. This relationship, however, has almost exclusively been analysed in the ‘Western’ context. China, despite what the official narrative seems to suggest, was not the mere passive victim of “the most ferocious form of imperialism” (Epoch Times 2014). It had earlier been an active, and rather successful, imperial agent itself. Mapping and colonialism worked in perfect tandem during the Qing’s territorial aggrandisement of the Chinese state. These cartographic endeavours, which were contemporaneous with similar developments in Bourbon France and Romanov Russia, sowed the early seeds from which the modern Chinese territorial state that we know today could emerge. Political maps represent a perennial and idealised reality which feeds into the geographic imaginary of the state. The fact that maps are a dehistoricised abstraction of territory is something that remains difficult to grasp, even (or perhaps especially) for heads of states. The map that Merkel thought was an appropriate gift had earlier, during Qing China, been instrumental to the colonial introduction of the notion and concept of territory in China. The reality that maps represent is, however, never static or immutable. State territory is rather historically produced and in constant need of reimagining. Historical maps reveal that territory is not an outcome but a historical process. The reality of China in the discussed 1730s map is very different than it is today. This means that the older map can challenge the way we think about and look at the presumed naturalness and truthfulness of territory today. The result, as I have shown, is that different geographic imaginations emerge and inevitably collide with and challenge each other. The dispute revolves mostly around the so-called Senkaku/Diaoyu Islands in the East China Sea in which maps play an important role (see Nieuwenhuis 2013). 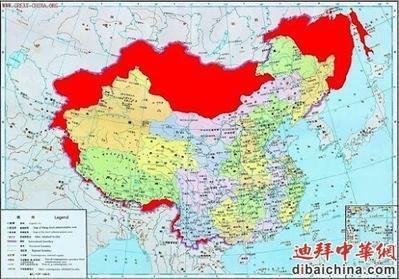 Qing China secured its modern northern territorial borders with Russia, for example, during the 1689 Treaty of Nerchinsk and again in the 1727 Treaty of Kiakhta. The Nerchinsk Treaty, for which the primarily language was Latin(! ), was historically significant because it granted an early form of bordered sovereignty to both Empires. The bordering of the area heralded the climax of the closing of the Eurasian landmass and anticipated the gradual end of nomadic life in the region.